Although it is hard to estimate the number of slaves who came from current Arab countries such as Morocco, there are records that refer to the arrival of Arabic speaking Muslim slaves who would not eat pork in 1717. Ben Ali is among the few well-documented slaves. Like other prisoners on French vessels, he jumped ship in America. Later, he was a scout to the famous General Sumter during the Revolutionary War. Ben Ali changed his family name to Benenhaly. His sons later fought with the Confederate Army. During the late 1700s, the South Carolina House of Representatives ruled that Moroccan Arabs living in the state should be treated according to the laws governing whites. The acknowledgement of Moroccan Arabs in the legal documents attests not only to the number of Moroccan Arabs in the South at the time, but also to the discriminatory nature of the laws, which privileged those classified as “whites”. Antonius Bishallany was among the early travelers who came to the United States after meeting American missionaries and tourists. Originally from a village in Greater Syria (which includes modern-day Syria, Lebanon, Jordan, Palestine, and Israel), Bishallany came to the U.S. in 1854 with the names and addresses of Americans he had met while working as a tour guide in Beirut. Although born a Maronite Catholic, Bishallany had converted to Protestantism - an act for which he was shunned by his community. He then came to study in the U.S. with the intention of going back to his country and becoming a Protestant missionary for his own people. After arriving at the port in East Boston, he soon made his way to New York City where he is reported to have worked as a butler. He then received a scholarship to study at the Amenia Seminary in upstate New York in return for giving Arabic lessons to missionaries preparing to go to the Arab world. Before he could finish his studies, he became ill and died from tuberculosis. Bishallany is buried with a Bible in Greenwood Cemetery in New York City. 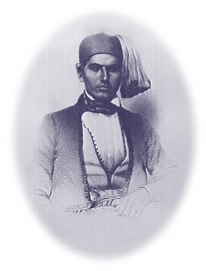 Hadj Ali is another well-known Arab who came to America in the 19th century. He was brought from Syria by Major Henry Wayne, upon the recommendation of Secretary of War, Jefferson Davis. Hadj Ali's skills in training camels were needed to help run the famous Camel Corps, which would build and supply a wagon route from Texas to California. The soldiers called him "Hi Jolly" because they couldn't pronounce his name. At the end of the war with Mexico in 1840, the US acquired the current state of Arizona. With this acquisition, crossing the desert during the Gold Rush presented an opportunity and a challenge. At a time before the railroad connected the East and West Coasts, crossing the country depended on horses, mules, and oxen-animals which required plenty of water. The scarcity of water in the Southwest prompted Secretary of War, Jefferson Davis, to propose a Camel Military Corps to Congress. The plan was to utilize the camels to help build and supply a wagon route from Texas to California. In 1880, Ali became a citizen with the name Philip Tedro. The Arizona State Highway Department erected a monument to him over his gravesite in 1935.